Brisbane’s Updated Modern Kitchen Design Studio is now at Stones Corner, QLD. Our accessible kitchen showroom features the latest in kitchen appliances. For your custom kitchen renovation needs, our Modern Kitchen Design Studio is open just for you. We cater to all of your kitchen renovations, designs and planning solutions. We have in-home design consultations including 3D image viewing available just for you. We are located at Unit 15, 76 Old Cleveland Road, Stones Corner with accessible parking off Laura St.
We only feature the latest in design, colour and texture when it comes to stones, sinks, benchtops and more. Plus, only the best and modern appliances for our clients. During the opening, we featured stunning two pack Hamptons style kitchens with loads of features and a kitchenette in a flat door with ABS edging in multiple finishes. Finishes include sheen, gloss and matte in one display. When it comes to kitchen renovation needs, Craftbuilt Kitchens makes it a point to always provide options for the client that will suit their needs and personality. Here’s Justine, the general manager, personally showing the client the different cabinetries, storage function and safety features that are so popular right now for the modern family and the modern home. You can also check out the state of the art and modern samples, kitchen appliances and benchtops that are timeless and also trending. Craftbuilt proudly recommends and sell Kleenmaid appliances from dishwashing machines to cooktops and ovens. Kleenmaid’s modern style appliances are the finishing touch to compliment your new Craftbuilt Kitchen. Since 1984, Exceeding Expectations has been the driving force of the combined worldwide network of designers and engineers who manufacture Kleenmaid appliances. The Kleenmaid technical team demand excellence in every product bearing the Kleenmaid name and Craftbuilt is proud to display the latest in cooking technology. Showcasing the Kleenmaid ovens, the smell of freshly baked damper livened up the studio during opening day. We baked this delicious gluten-free damper in a Kleenmaid Combi Steam. Using the combination ventilated oven & steam function at 180 degrees, the bread was baked for 40 minutes. The end result was so soft and fluffy on the inside with a nice crunchy crust. Serve with butter and jam! Whether you are planning for your kitchen renovation in the Northside, Westside, Southside or Eastside area of Brisbane, Craftbuilt Kitchens is happy to assist you with your renovation and planning needs. We design with you, just for you! 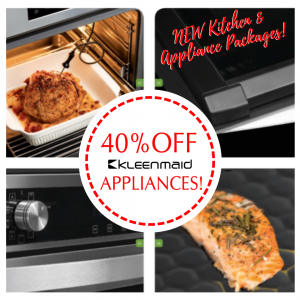 You can save more with this amazing kitchen-appliance combo!